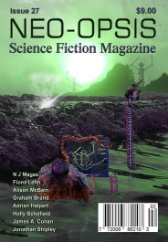 My story The First Hundred is in the latest issue of the Canadian science fiction magazine, Neo-opsis. May was a fun month for me. I had a piece of flash fiction, Bodyshop, published in Every Day Fiction on the 5th and then a short story, Cutting It Fine, appeared in Electric Spec on the 31st. The options for writing your novel in the cloud are improving all the time, but the combination that I'm happiest with at the moment is Novlr with Workflowy open in a separate window. There are web apps out there that have more features, but there's a beauty and simplicity to Novlr that I love. As you start to type, the toolbars fade away, leaving you with just your words. I'm continuing my exploration of the options available to writers with a Chromebook, or anyone else who wants to use only applications that are available in the Cloud. Spaaze is the most enjoyable way to storyboard your plot that I've found so far. It's got a good cork background and the interface takes up very little screen space, so you can browse your scene cards without distraction. J. K. Rowling famously wrote Harry Potter in the cafés of Edinburgh (though not, apparently, at the one in the photo). I was in Edinburgh too this weekend, with my days free while my wife was at a storytelling workshop, and I can recommend writing while pottering around the city. Awful pun aside, this is a really good way to get words down. I stumbled into it by accident, but I'll definitely do it again.